We changed the way we machine all our sheaves, rhino and wolverine alike. The part in the sheave that cam plate slide runs on I call the tower is what we changed. You can see the picture at the bottom of this page and the video showing the difference. The sheaves are cast aluminum and in the cast they have what is called draft meaning the "straight" parts are not straight they have a angle to them to be able to come out of the mold easier. So looking at the pic below you would notices the bottom of the tower is wider as it goes down and angles out at the bottom of the inside edge too. In stock form with grease this is not that big of an issue because the camplate and sheave do not go down that low and where they do go the grease helps it move off it. I am not condoning grease, it is still evil!!! LOL To be able to give you the lower starting ratio or lower end performance we are allowing the cam plate to go deeper in the sheave which allows the belt to go lower in the clutch. So we squared them up so the cam plate slide slides all the way down freely. We also created a bit more tolerance to make the clutch work better as it gets dirty. If you know anything about a M-16 Military rifle, they make the tolerances loose so it operates in dirty environments better. We took the same approach. Also, in the process of setting the programming up for the CNC machine to do this, we found out the casting process from yamaha is very inconsistent. We can machine one and we will only take a couple thousands off and put in another and remove more. But what I told my programmer is, "We are taking imperfect parts and making them perfect" which is true. After the CNC process the sheaves are totally symmetric. What did we accomplish by doing this? 3. Increased the efficiency of the clutch system, should shift out smoother and backshift faster for even better performance. 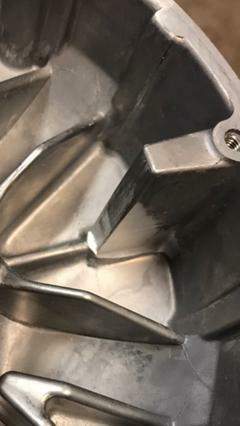 If anyone wants this machining done to a sheave bought from us that does not have it, there will be no cost only return shipping.